Kinesiology tape or "k-tape" is a latex-free cotton strip with a sticky adhesive that holds it in place. It seems like every athlete you see on television is sporting these brightly coloured spider webs of tape—shoulders, stomachs, legs, arms and more. But what does it actually do for them? Kinesiology tape or “k-tape” is a latex-free cotton strip with a sticky adhesive that holds it in place. It’s designed to mimic human skin, with a wave-like pattern similar to fingerprints that allow for airflow. K-tape is also waterproof, so it can be worn while swimming. K-tape is worn on many different parts of the body for many therapeutic reasons such as pain relief, performance enhancement, and injury prevention. Because k-tape is elastic and thin, it can be worn without binding or restrict your movement. While a physiotherapist can apply the tape during an appointment, you can also be taught to apply it at home. The first k-tape was developed by Dr. Kenzo Kase in 1979, using it to help sumo wrestlers in Japan who sustained many injuries across their bodies. As a chiropractor, Dr. Kase saw the benefits of manual therapy on his patients but wanted something that would help in between appointments. The tape was originally created in a flesh-tone, but a Japanese schoolgirl complained to Dr. Kase that the colour made her feel ill, so he added a shocking blue and pink. Later on, many athletes asked for black, suggesting it looked like a stronger colour. K-tape’s popularity rose in 2008 when many people saw Olympic athletes wearing the coloured tape during the Beijing Games. Since pain sensors lie between the first and second layers of your skin, applying the tape lifts the first layer slightly to create space for increased blood flow and decreased pain, as well as inflammation. It also provides support and stability for joints or muscles, holding muscles in place (according to how the tape is used), while still allowing a full range of motion and circulation in the area. K-tape can be a useful tool for anyone with musculoskeletal and athletic injuries, as well as inflammatory conditions. Taping methods are helping more and more patients with muscle strains or weakness, ligament sprains, joint instability misalignment, poor posture, shin splints, tendonitis, rheumatoid arthritis, lymphedema, recovering fractures and more. Want more information? 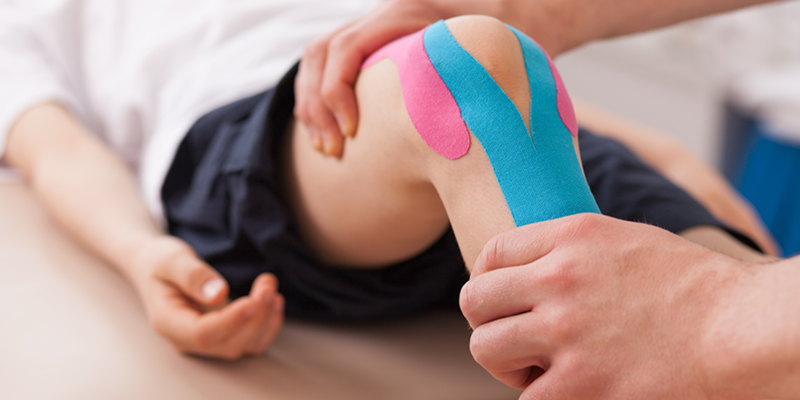 Many of pt Health’s physiotherapists are trained to use k-tape, as part of a patient’s treatment program. Find one in your area.